The media is strangely drawn to Maria, so it was no surprise to me when Channel 6 Action News picked Maria out of a crowd of over 100 to interview for opinions about Kansas basketball. 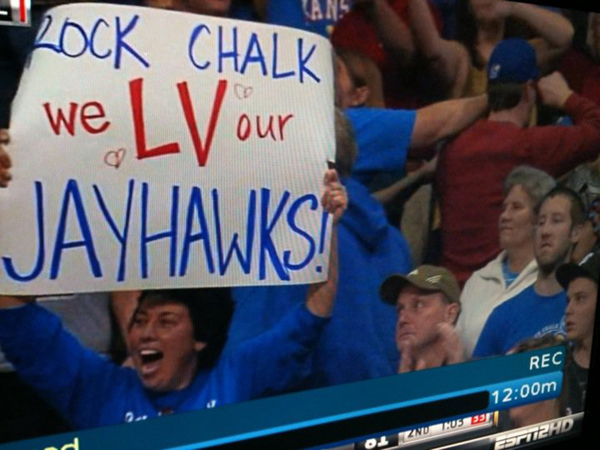 Ahhh Vegas, what better place to watch some non-conference Jayhawk basketball action. The Las Vegas Invitational is an odd-ball event in that there were eight teams, but competing for two separate tournaments. Kansas was scheduled to play Ohio and Arizona regardless of the outcome of the other games, so we knew there would be at least one good game. 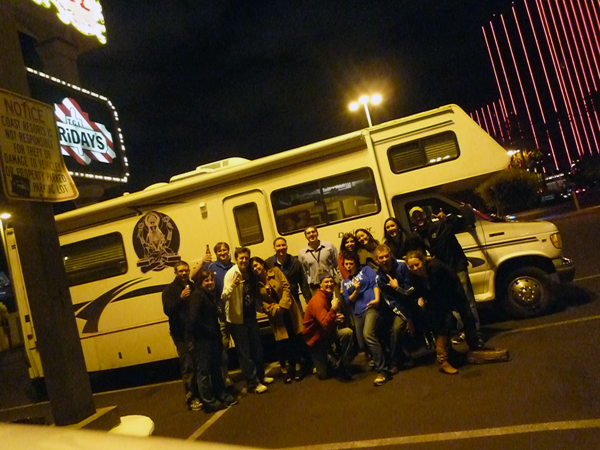 Friday’s game against Ohio found us parking Stanley in an external construction lot at the Orleans where we had some pregame food and drinks before we headed into the Arena. Along with Maria and myself were our friends Mike, Andie, Carlos, Jenn and Jimbo. 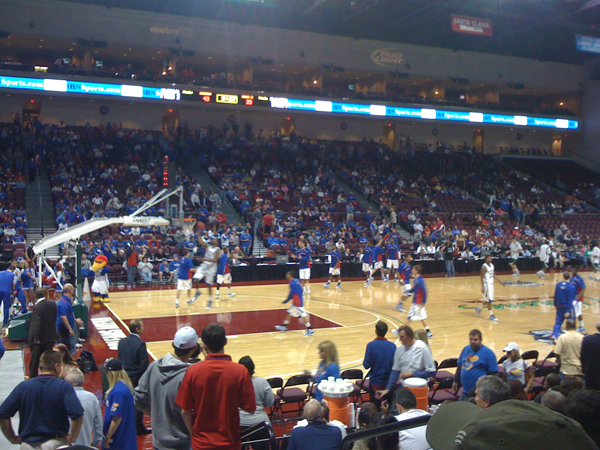 The first thing that struck me entering the arena was the pure number of Jayhawk fans that were rolling in. For some reason I thought KU would have this small section section in the corner. I was way off as Kansas blue filled the arena, and I would say it was 95% Jayhawk fans to 5% for Ohio. The crowd definitely made the team feel at home as they got out to an early lead and never looked back. The second game against Arizona was easily the more anticipated match-up as the last several meetings a between these two programs have created thrilling games that go down to the wire. The great match-up ensured that it would be shown on ESPN and Maria was determined to get on TV. 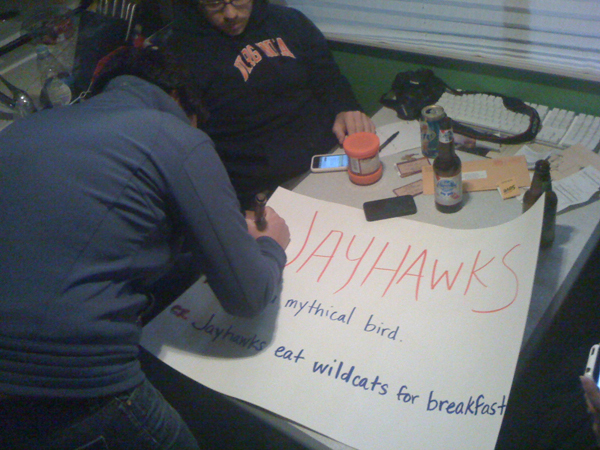 So we put together some “clever” signs and headed in to the arena. The second being a nervous tension in the crowd as all the fans who bet on the games 9 point spread were jerked back in forth as the the point difference teetered between 8 and 10. Ultimately an uncontested lay-up by Arizona put the difference at 8 causing many Hawks to lose (sorry Mike). The Orleans was able to keep a lot of the Jayhawk fans at their resort by handing out free drink coupons and the bar tenders even went the extra mile and were all wearing KU gear. After the free drinks were exhausted, Maria corralled a group of friends and convinced them to pile in Stanley and head over to the RIO. This was easily the most people we have had in Stanley. Luckily the Rio was only a mile away. Overall it was a great way to spend Thanksgiving weekend, and I couldn’t be more Thankful for the opportunities this trip has brought and the good friends that were able to share this experience with us.